I’m OK – You’re OK: A Practical Guide to Transactional Analysis was published in 1969 and went on to sell over 15 million copies in nearly 25 languages. 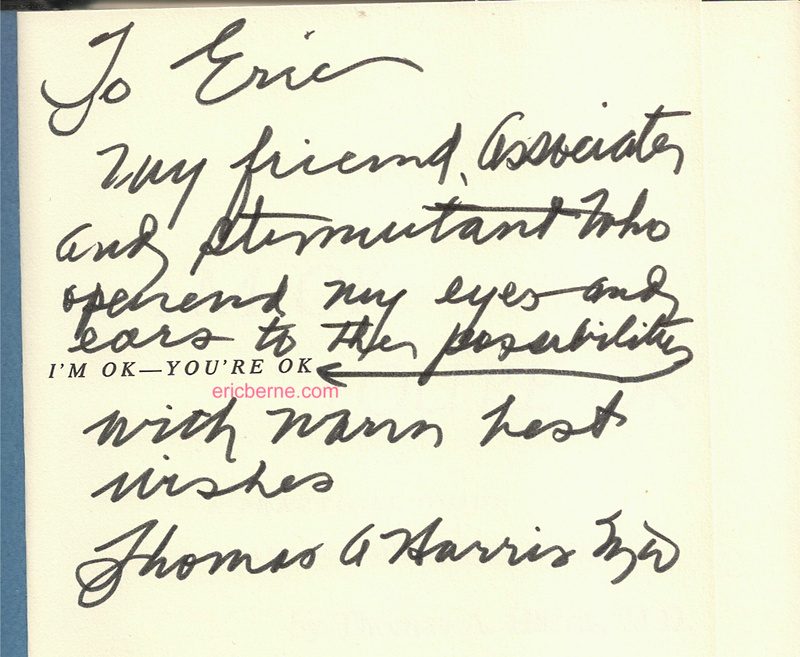 The exact details of Dr. Eric Berne, Transactional Analysis, and Harris’s view are seen here. This page deals primarily with the success of the book and its impact. Harris began learning the theories of Transactional Analysis around 1960 directly from the creator of Transactional Analysis, Dr. Eric Berne MD. Harris observed the runaway success Dr. Berne achieved with Games People Play in 1964. Despite the numerous literary accomplishments of Games, Harris felt that he could simplify Berne’s theories even more and make them more accessible to a wider audience. Harris began writing the book in 1967. Using Transactional Analysis as a foundation for his book, he developed four possible positions (I’m not OK – You’re OK, I’m OK – You’re OK and two others). The position I’m OK – You’re OK was chosen for the title because it was catchy and because it was the position one should achieve. I’m OK – You’re OK was published in April 1969 by Harper and Row with an initial printing of 7500 copies. There was very little advertising behind the book and only a few reviews. However, by the end of 1969 it had sold over 20,000 copies. Early into 1970, sales began to pick up, primarily in the Midwest and on the West Coast where Transactional Analysis originated. The book became especially popular among church groups. By the Summer of 1970, it was on the best-seller list of Dalton’s (Dalton’s was large national bookstore with nearly 800 stores at it’s peak; it is no longer in business), reflecting the popularity of the book. By mid 1972, when paperback rights were being negotiated, over 550,000 copies had been sold. Harris had initially received approximately $5,000 as an advance on royalties in 1969. By 1972, prior to the paperback rights of I’m OK – You’re OK being sold, it was estimated that Harris had earned approximately $500,000 in royalties. On June 25, 1972, I’m OK – You’re OK hit number one on the New York Times Best Seller list for non-fiction books. In July 1972 when the paperback book rights were finally sold, it broke a record, eclipsing the one set by Berne’s Games People Play. The paperback rights to I’m OK – You’re OK were sold for $1,000,000 to Avon Books. This broke all previous records for the reprint sale of any published book in history (note that this record has since been broken). Once on the mass market as a paperback, sales continued to climb, and soon the 1 million copies sold record was hit. Due to increased demand worldwide, translations were put on the market. Transactional Analysis had gained a strong foothold in Europe so French, Spanish, and German copies were among the first. Soon, you could find copies of Ich Bin O.K. – Du Bist O.K. on the bookshelves of Berlin. As the year 1972 concluded, I’m OK – You’re OK finished as #1 on the New York Times Best Seller List for non-fiction works. In 1973, the book continued to sell well, and ultimately remained on the Best Seller List for exactly 70 weeks. In contrast, Games People Play was on the Best Seller List for over 100 weeks, but never hit the coveted number 1 spot. I’m OK – You’re OK, along with Games People Play, continued to sell briskly throughout the 1970s, with each selling several million copies. Transactional Analysis continued to grow in popularity worldwide. But for the mainstream, readers began looking to alternative “self-help books.” Harris ultimately published a sequel called Staying OK but that never achieved the widespread sales or popularity as his original. As already mentioned, Dr. Eric Berne developed Transactional Analysis, and Harris had been a close student of Berne for many years. As a result, Harris was deeply indebted to Berne. Clicking on this image will bring you to a larger, higher resolution version. The New Yorker Magazine has always been a widely read and influential weekly magazine. Their cartoons are famous. So if the New Yorker is poking fun at something, it must be relevant! A 1972 article in the New York Times which states the publication date of April 1969. The original copyright states 1967, 1968, and 1969. Harris began work on I’m OK – You’re OK in 1967. This is why it is sometimes confused. But the publication was 1969. A wealth of information is located at ericberne.com regarding Transactional Analysis, Games People Play, and a biography of Eric Berne, amongst other resources. A 2004 essay in the New York Times on self-help books discusses I’m OK – You’re OK and Games People Play and how today’s self-help books pale in comparison. Note that this article incorrectly states the publication date of I’m OK – You’re OK is 1967.